You have to admire Mercedes-Benz sometimes. Back in 1991, it had customers begging the company to put its technologically groundbreaking, race-car-for-the-road, V12, gullwing supercar, the C112, into series production at whatever price it wanted. And Mercedes didn’t bother, mostly because it felt it had more important things to do. When Mercedes-Benz first unveiled the C112 as a show car back in ‘91, it pitched the car as a pretty much production-ready, road-going partner to Mercedes’ thundering Group C sports car that had won the 24 Hours of Le Mans and just about every other race available. Here, for instance, is a publicity photo I scanned showing the two cars together. It would have been the greatest gullwing supercar of its time, a road-going equivalent of the resurgent Silver Arrows on the race track. It would have been a wailing V12 beast, constructed with stolid Mercedes quality. It could have been a legend. But Mercedes management decided, over some internal disagreement, that the company didn’t really need an image-building supercar when it had so much success with its resource-intensive production car projects as it was. 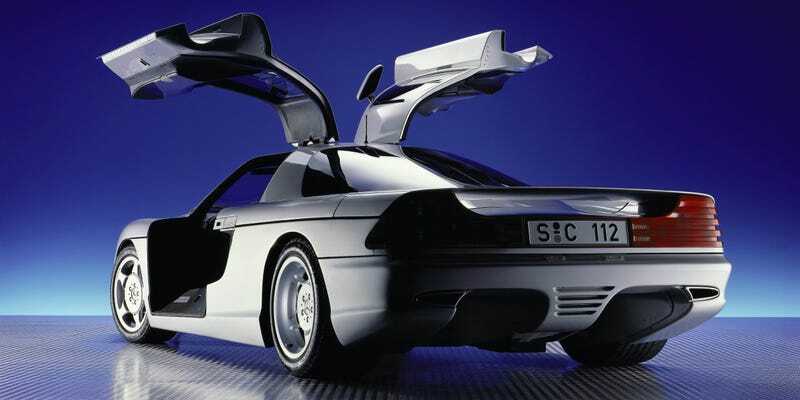 Mercedes publicly said that the world didn’t need another high-speed sports car, possibly as a nod to Germany’s powerful environmental movements at the time, and decided to debut the C112 as a non-production concept. Even the 700 firm orders that the company could have filled at “whatever the price” did not change the decision. The result is that the C112 is the most thoroughly developed and best engineered and executed “show car” that has been supplied by a European maker in many years. Indeed, the C112 could have been one of the fastest, most technologically advanced road cars in automotive history. Mercedes had every ability to go ahead with it – the C112 was even designed to pass American crash and emissions tests – but just felt it didn’t need to bother. But my god would it have been an amazing machine. If you think of the modern idea of Mercedes-Benz, conservatively styled but extravagantly designed with lots of advanced technology, you can trace back to the C112. Mercedes advertised the car as something like a Group C race car for the road. It had spoilers front and rear, underbody aerodynamics including a big rear diffuser, two seats in the middle and an engine behind them. But Mercedes wisely kept the C112's ethos to integrating a lot of good race car features into a workable road car design. M-B didn’t fall into the usual trope of trying to turn a hot, cramped, fragile race car into something very compromised on the street, a bit like they did a few years later with the cool-but-hopeless CLK-GTR. So while the World Sports Car Championship-winning 1990 Mercedes C11 racer (run under the watchful eye of Jochen Neerpasch, the same guy who turned Ford RS’s success into founding BMW M) had a carbon fiber chassis, the road-going 1991 C112 has an aluminum frame. While the C11 had a high-strung V8, the C112 had a refined production-based V12. While the C11's cockpit was a tiny bubble of buttons and switches, the C112 got typically Mercedes spacious leather-lined opulence. The C112's suspension had inboard springs and dampers, but the double-wishbones actually holding onto the wheels were very similar in basic design to the (now legendary) Mercedes 190E and W140 S Class production cars. The C112 even got climate control and a sweet Blaupunkt Mexico stereo. Man that interior is so 1990s. No plastic at all, but big jellybean ovals and buttons and nothing else. This car, I should also mention, was constructed by Mercedes’ Italian design house friend Coggiola. So the C112 had a race car design style, but production-oriented practicality. Where it departed from both ideologies was in its technology. The C112 got active aero, active suspension, power steering, power braking, power clutch, variable steering, variable braking, rear steering, air braking, ABS, traction control, tire pressure monitoring, and even radar-guided cruise control. The car basically had the features of a late ‘90s luxury car, mixed with a 2000s supercar, constructed in 1991. Active aerodynamics gave additional assistance to the driver when the C112 reached its limit of traction in either cornering or braking. Sensors measuring g-forces in the front, middle and rear of the car gave information to the ECU that controlled the C112's actively variable aerodynamics. When triggered by their control system, a front spoiler and a small rear airfoil were deployed in one-tenth of a second. Combined, these created a high level of overall downforce with an inevitable increase in drag. At the car’s theoretical top speed of 192 mph, they were calculated to increase downforce from an insignificant figure to around 2,200 pounds. Spoiler and airfoil were activated when the ECU judged that the tires were losing their grip on the road. At first, the spoiler and airfoil were driven by electric motors, but these deployed them too slowly. Hydraulic systems were substituted to gain faster action. The front and rear aids had to hit the airstream together to preserve the C112's overall aerodynamic balance while generating its ton of downforce. This would come to the rescue of a driver in distress like a giant hand pressing the car down on the roadway. So the C112 (that’s pronounced C one hundred twelve, if you’re curious) hydraulically extends its spoilers for added grip only after you have already started to lose control. Screenshots from Mercedes-Benz’s demo video. That seems like a really horrible idea. More straightforwardly good was the hydraulically-actuated rear steering, much like you’d find on a new Porsche 911 GT3 RS. I say that it was good not because I am necessarily a big fan of rear-wheel steering, which tends to be unnecessarily heavy and complicated. No, I like it because it was really cutting edge at the time and also it had the best name ever. Cybernetic steering. Mercedes actually called it that. A grainy scan of Mercedes’ active rear suspension setup. Mercedes also gave the car active suspension, with little hydraulic actuators at the top of the shocks that would work against the car’s natural momentum when it would want to squat under hard acceleration, dive under hard braking, lean in hard cornering, or bounce over repeated bumps in the road. The idea was that you could have a generally soft suspension set up for comfort and let the active shocks keep the car level and controlled. What’s cool is that all of the car’s active systems all ran off of the same set of sensors all linked to the same electronic brain. Getting these different systems to all work together is one of the great challenges of modern car design, and tuning everything to work together is what separates the good from the great. It all reminds me of Paganis of a decade later. There’s the same wedgey Group C styling and ethos, but matched to a luxury experience and a V12 to match. The C112 was not the outright fastest car of its day, or the lightest, or the most powerful. But it looked like would have been a genuinely wonderful road car. The only ill point about it was that the radiators and movable flaps up front meant the car had no trunk or spare tire. Otherwise the C112 was just about perfect. The C112 came at a very interesting and important point in Mercedes’ history as well. It was the ultimate product of the then-chairman Werner “Mr. Mercedes” Niefer. He lived “the German version of the American Dream,” as one later obit remarked. Niefer started as an apprentice toolmaker in 1943 and worked his way to the top, bringing the at Mercedes back to racing, putting fuel injection in every car in the production lineup, and generally dragging one of the most conservative automakers in the world into something resembling modernity. He produced the “baby Benz” 190 that shocked the world in its low-priced/small-sized audacity. The guy really pushed the make out of its single passion of just making wildly overbuilt passenger cars. But his Mercedes had two sides; he might have set in motion the cheapening of the brand, but he still very much dreamed big. He produced the monumental W140 S Class (on which the Maybach 57 and 62 were based years later) and also the reviled first-generation C class. Niefer ultimately left the company at 65 years old, not long after a scandal about illegal arms sales to Iraq and a $50,000 payout that resulted from when he asked to take the wheel of a company van during a trip to Italy and then crashed into a 28-year old bicyclist, tearing the calf off of her leg. The C112 was very much his car; ambitious and monumental, but questionably useful and quickly forgotten. Now that the years have wore on, the car looks better and better, but what stands out the most in retrospect is the sheer might of Mercedes at the time, so impossibly successful with production and race cars that they didn’t even feel a need to construct one of the most advanced cars of its day.